2. Token: After registering and paying entry fee, the angler will receive a “token” that must appear in each photo of a measurable fish. Before the start of the tournament, the Tournament Official or his designee will give out a unique “tournament number”. The tournament number should be written on the token. The token shall be considered “visible” in a photograph as long as the entire “tournament number” can be seen on the portion of the token that is in the photograph. 3. Start and Finish Times: Tournaments will be posted on our Facebook page and the Tourneyx.com website. The Official Time is determined by the timepiece of the Tournament Official or his designee. No other watch or cell phone times will be accepted as a valid time. Any angler not in line by the established time for that tournament’s Check-In shall be disqualified. Anglers may only check in their own fish. 4. Watercraft: Fish must be caught from “man powered” fishing watercraft. “Man powered” watercraft shall include only kayaks, canoes and SUP’s. If you have a question as to the legality of your watercraft for these tournaments please contact us prior to the day of the tournament. "Mothershipping" i.e. the towing or transporting of a kayak by a gasoline or electric powered boat is strictly prohibited. Anglers may not receive any assistance from anyone in a gasoline or electric powered boat unless it is of an emergency nature, in which case the anglers catch for the day will be disqualified. Only one angler may fish from a vessel; participants may not fish from the same vessel. Sharing of catches is strictly prohibited— an angler may only count the fish he/she has caught. 5. Launch: All anglers must launch and take-out from public access points. The use of private property that is not open to the public, even with the permission from the landowner, is strictly prohibited. Trespassing on any property to launch or take-out is strictly prohibited. Private properties that charge a launch fee or day use fee are allowable access points, as long as the properties are open to the public and accessible to any angler. Any angler who launches or takes-out from a location prohibited by this section is subject to disqualification from the tournament and forfeiture of any prizes. Any angler who launches or begins fishing before the approved time is subject to disqualification from the tournament and forfeiture of any prizes. 6. Tournament Format: All Bluegrass Kayak Anglers tournaments are to operate as CPR -Catch, Photograph and Release. Fish are not to be brought to Check In - doing so will result in disqualification. i. All fish must be taken with a fishing rod, line and hook on the day of the tournament during tournament hours. Absolutely no other method will be permitted. Snagging is not permitted. Anglers can only have one line in the water at any time. 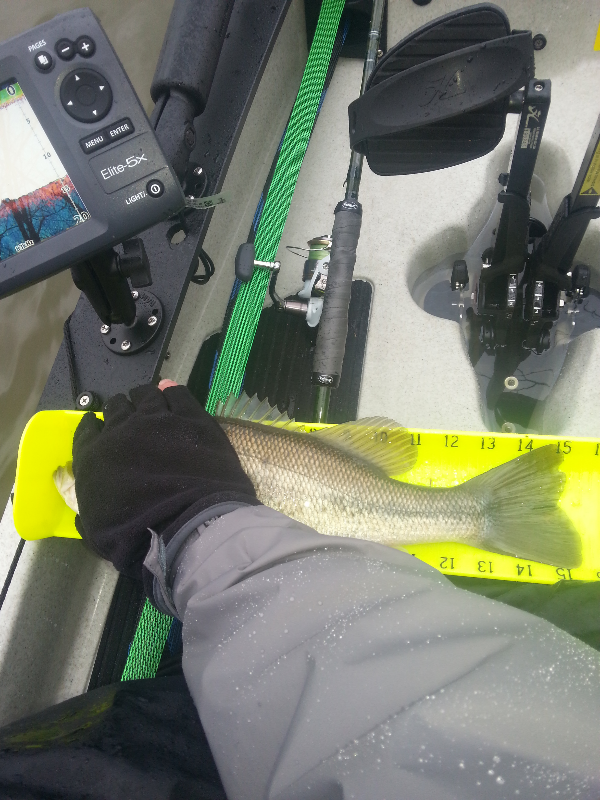 Trolling is permitted with the rod being hand held or in a rod holder as long as only 1 line is in the water. Anglers can not cast while trolling. The use of Umbrella, schooling, and tandem rigs is permitted as long as the number of lures is in compliance with state laws. An angler found to be fishing with multiple lines in the water at one time may be subject to disqualification from the tournament and forfeiture of any prizes. ii. Artificial lures only - NO LIVE BAIT. Any angler found to be using live bait during a tournament is subject to not only disqualification from the tournament and forfeiture of any prizes, but a lifetime ban of membership and any Bluegrass Kayak Anglers’ event. iii. All fish caught and photographed must be alive. Any angler who submits a picture of a dead fish is subject to not only disqualification from the tournament and forfeiture of any prizes, but a lifetime ban of membership and any Bluegrass Kayak Anglers’ event. i. 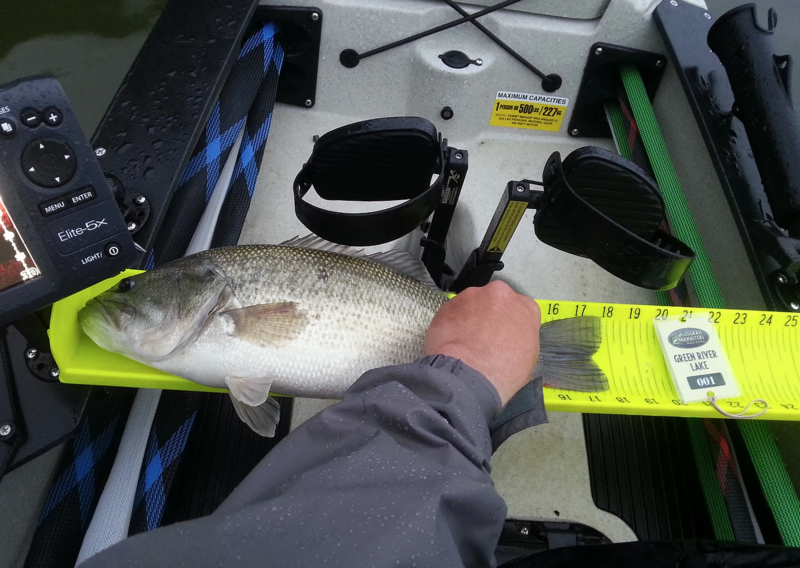 All fish must be photographed on an official “Hawg Trough” measuring device. ii. Every picture of a fish must have the unique token for that particular tournament, with the “tournament number” showing on the token, and the angler’s watercraft visible in the photograph. iii. All pictures must be taken with the upright vertical end of the Hawg Trough on the left-hand side of the picture frame, with the fish facing to the left, the belly of the fish facing the bottom of the picture frame. Photographs of fish in an improper orientation will not be scored. iv. The fish’s lip must be touching the upright vertical end of the Hawg Trough, with the mouth closed. If a judge is unable to ascertain with certainty that fish’s lip or mouth is touching the Hawg Trough fence, a 1’ penalty will be assessed. If it is certain that the fish’s lip or mouth is not touching Hawg Trough fence, the fish may not be scored. Photographs of fish with the lip not touching the vertical end of the Hawg Trough will not be scored. Photographs of fish with the mouth not closed shall be penalized up to 1 inch. v. The fish’s tail may be either pinched or laying naturally on the trough, but the tail must be laying flat against the Hawg Trough. 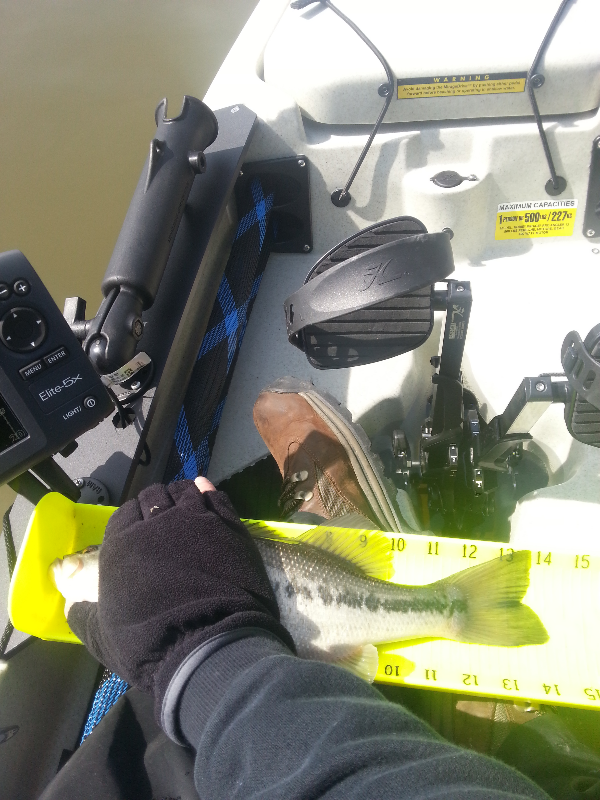 Photographs of fish with the tail not laying flat on the Hawg Trough will not be scored. vi. Photographs can be taken by either digital phone or camera. It is the angler’s sole responsibility to turn in a clear photograph for each fish being considered. Photos that are blurry, overexposed, dark or taken at a bad angle will be judged as accurately as possible, but may result in less than optimal results due to the quality of the photo, as the official measurements are at the discretion of the Tournament Official or his designee. vii. The angler’s hand may appear on the fish in the photograph, as long as the mouth, tail, and eye are clearly visible and the hand is not excessively covering markings of the fish. Securing the fish with any portion of a hand under the fish’s gill flap is prohibited. viii. No device other than the anglers hand shall be used to secure the fish to the Hawg Trough. Anglers may not use “clips”, “stringers”, or “fish grips”; no device of any kind can be touching the fish or in the fish’s mouth while taking photographs on the Hawg Trough. Lures may not be in the fish’s mouth in the photograph. Photographs of fish secured to the Hawg Trough with a device other than the angler’s hand, or with a lure in its mouth will not be scored. ix. An angler may only submit one picture per fish and only up to 3 different fish to be scored for that day’s tournament. x. All rulings by the Tournament Official or his designee will be final. i. We strongly believe in maintaining our precious resources, so care is to be exercised at all times in handling fish to ensure they are released unharmed into the water. Intentional mistreatment of fish in any manner will result in disqualification. Anglers are expected to photograph fish as quickly as possible and then release fish. 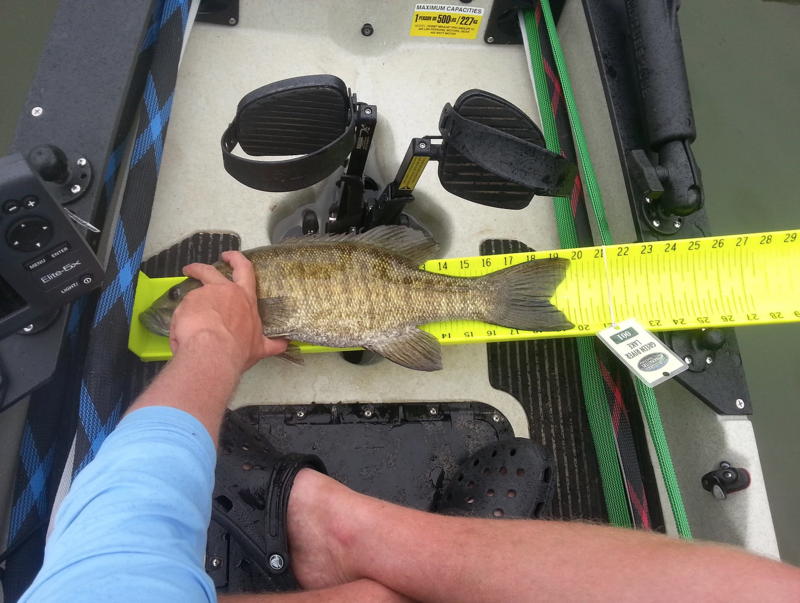 No fish are to be kept for personal reasons while participating in a Bluegrass Kayak Anglers tournament. Failure to release all fish will result in disqualification. 7. Scoring: Tournaments will be scored by using the aggregate length of each angler’s longest 3 fish, minus any penalties incurred. Fish will be measured by the judge(s) and rounded down to the nearest ¼-inch. The highest total in inches will be the winner. If two anglers should have the same total length, the angler with the longest big fish will win the tie breaker. Should both anglers have the same length big fish, the anglers second largest fish will determine the tie breaker. If both anglers have 3 fish that are all the same length, the tie breaker shall be determined by the angler that weighed in first. Fish that will be eligible for measurement in each tournament will be: Largemouth Bass, Smallmouth Bass and Kentucky or Spotted Bass. Angler may catch and count any combination of the eligible fish to count toward their total. No other species will count toward an angler’s total. Minimum size is 8 in. A. Any angler not in line by the established time for that tournament’s Check-In will be disqualified. B. Photographs of fish with the mouth cracked or open slightly shall be penalized ½”. Photographs of fish with the mouth clearly open shall be penalized 1 inch. C. Photographs of fish in an improper orientation will not be scored. D. Photographs of fish with the lip not touching the vertical end of the Hawg Trough will not be scored. E. Photographs of fish with the tail not laying flat on the Hawg Trough will not be scored. F. Photographs of fish secured to the Hawg Trough with a device other than the anglers hand will not be scored. If any portion of a hand or fingers are under the fish’s operculum (hard gill flap), the photograph will not be scored. G. Photographs of fish with clips”, “stringers”, “fish grips”, “lures” or any other device in the fish’s mouth will not be scored. H. Any angler found to be fishing with multiple lines in the water during a tournament is subject to disqualification from the tournament and forfeiture of any prizes. I. Any angler found to be using live bait during a tournament is subject to not only disqualification from the tournament and forfeiture of any prizes, but a lifetime ban of membership and any Bluegrass Kayak Anglers’ event. J. Any angler who submits a picture of a dead fish is subject to not only disqualification from the tournament and forfeiture of any prizes, but a lifetime ban of membership and any Bluegrass Kayak Anglers’ event. K. Any angler who launches or takes-out from a prohibited location is subject to disqualification from the tournament and forfeiture of any prizes. L. Any angler who launches or begins fishing before the approved time is subject to disqualification from the tournament and forfeiture of any prizes. 9. BKA Membership: Anglers do not have to be a member to fish in the tournaments and compete for cash prizes. However, anglers must be a member of Bluegrass Kayak Anglers to be eligible for prize drawings at the conclusion of each tournament, and to participate in the Angler of the Year race. Points for Angler of the Year will only count after the angler has become a member (I.E. an angler cannot fish in a tournament and then decide to join after that event is over and have that days points count toward AOY). 10. Prize Drawings: Anglers must be a BGYM member to be eligible for the prize drawings, which will be held at the conclusion of each tournament. Only one kayak may be won by an individual during the season’s drawings. Kayak winners will be eligible for other prizes during drawings at later tournaments; they will not be eligible to win a second kayak. Drawings will be determined by tickets given out at each event. Anglers must be present in order to participate in the drawings. 11. Angler of the Year: Angler of the Year will be determined by the club member who has the highest point total after the final event of the year, The BGYM Classic. Anglers will count their best 5 finishes only toward Angler of the Year. Two day tournaments shall be scored as two separate tournament days. Scoring for AOY title will be: 100 points/1st, 99 points /2nd, 98 points/3rd etc. An angler must catch a fish to score points – if an angler is skunked or does not check in a fish at a tournament, the angler will have no score for that tournament. Tie breakers for AOY shall be determined by comparing the anglers’ highest tournament finishes over course of the year. If the anglers are tied for their highest finish, the tie breaker will be their second highest finish, third highest finish, fourth highest finish, etc., until the tie is broken. Should two anglers still be tied after comparing all tournament days for the year, the anglers’ largest fish of the year will be the tie breaker. 12. Safety: A PFD must be worn or on board each angler’s watercraft in accordance with KDFW regulations. Before sunrise, each angler must carry aboard and have immediately available for use a white light of sufficient intensity to illuminate the vessel in accordance with KDFW regulations. Safe boating conduct must be observed at all times. The consumption of alcohol or any other substance which impairs one’s driving ability during tournaments is strictly prohibited. Any angler found to be in violation of this rule during the tournament will be disqualified immediately. 13. Sportsmanship: Sportsmanship, courtesy, safety and conservation are expected from each angler. Any infraction of these fundamental sporting principles may be cause for disqualification. A determination of unsportsmanlike conduct will be up to the Tournament Official or his designee. 14. Fishing Boundaries: Each tournament may have restrictions concerning where anglers will be permitted to fish. If restrictions apply, information concerning boundaries will be given to anglers at registration of each particular tournament. Only fish caught in designated bodies of water are to be eligible; fish caught in unauthorized areas will result in disqualification. 15. Weather: Anglers are to exercise their own best judgment for safety when considering whether to fish in a tournament or not. Bluegrass Kayak Anglers retains the exclusive right to decide on cancelling or postponing an event due to inclement weather. If an event is canceled or postponed, the Tournament Official or his designee will announce the decision at the earliest possible time. 16. Judging Inquiries: Any judging inquiries or protests must be made in writing, accompanied with $75 cash, within one hour of the designated Check-In time to be considered. 17. Cheating Inquiries: Any inquiries of cheating will be handled by the Tournament Official or his designee, and polygraph tests may be used to settle any cheating disputes, at the cost of the angler in question. Any angler found cheating during a tournament is subject to disqualification from the tournament, forfeiture of any and all prizes, and a lifetime ban of membership and participation in any Bluegrass Kayak Anglers’ events. 18. Prizes: All prizes awarded by the Bluegrass Kayak Anglers or any of its sponsors are final. They cannot be transferred or exchanged for other prizes or cash/credit. Prizes awarded for each tournament are subject to change at the discretion of Bluegrass Kayak Anglers or its sponsors. Product and/or Cash prizes will only be awarded to the individual that won the prize. Anyone found violating any of the Bluegrass Kayak Anglers’ guidelines and rules are subject to forfeit any prizes that are due to them. 19. Waiver: A waiver releasing Bluegrass Kayak Anglers, tournament officials, tournament members, tournament participants, sponsors, etc. from all liability must be signed during the registration process; otherwise the angler is ineligible to participate. 20. In the event of a rule violation, the Tournament Director or board may impose such penalties as deemed appropriate by them, including without limitation, disqualification, forfeiture of entry fee and prizes, and prohibition from participation in subsequent tournaments. Cannot tell if fishes nose is touching board. Too much of fishes markings are covered, eye is covered. Token not in view. Too much flash from sun makes accurate reading of length impossible. Token not in view. Photo contrast is good – nose can easily be seen touching end of board. Note: lines on Hawg Trough are blacked in for easier viewing. Fishes nose touching end of board, majority of fish in sight with markings exposed.